Claire Trageser reports on the announcement that FoodBuster -- a game developed by two staffers at Calit2 -- won the popular vote in a competition to build 'Apps for Healthy Kids'. Melodika.net, the "home of music," reports on the Institute for the Future's collaboration with Calit2 on an interactive map, "California Dreaming: Imagining New Futures for the State." SmartGrid picks up a Milwaukee Journal-Sentinel article that mentions Calit2 as "the best example" of an initiative that pairs technology businesses with academic institutions to develop computer-driven solutions. Ecodirt.com picks up a story on the Institute for the Future's interactive map, "California Dreaming: Imagining New Futures for the State," which was developed, in part, by Calit2. Calit2 Director Larry Smarr is quoted in a report on an interactive map, "California Dreaming: Imagining New Futures for the State." Calit2 joined in an effort to explore alternative scenarios for California beyond the current financial crisis. The Business Journal's Brad Graves reports on a meeting of high-powered business leaders and Motorola Mobility executives, who recently met at Calit2 to discuss the possibility of Motorola Mobility moving to San Diego. Julie Meier Wright, president and chief executive officer of the San Diego Regional Economic Development Corp., told the group that Calit2 is a ?phenomenal San Diego asset.? Calit2 Director Larry Smarr and Calit2 Director of Visualization Tom DeFanti are cited in a timeline depicting the history of research contributions at the University of Illinois at Urbana-Champaign. Jay Bayne, executive director of the non-profit Milwaukee Institute, calls Calit2 the best initiative he's seen that partners technology businesses and academic institutions. Calit2 Director Larry Smarr is quoted in Jonathan Weber's New York Times piece about a collaboration between Calit2, the Institute for the Future and the Center for Information Technology Research in the Interest of Society (CITRIS). The partners have developed a new map called "California Dreaming" that illustrates four alternative futures for California. Christine Forester reports on world-class research institutions based in San Diego, specifically mentioning SIO, Calit2 and IR/PS at UC San Diego. Popular Science calls the Calit2 StarCAVE "something you?d expect to find in Lara Croft?s mansion" and highlights the immersive virtual reality environment in its photo feature (Calit2 is image 23 of 30). The National Science Foundation awarded a $10 million, five-year grant to researchers to explore a new paradigm for the way hardware and software interface in order to potentially reduce by as much as 40 percent the energy cost of computing. A $10 million, five-year grant from NSF will fund a project by Calit2-affiliated researchers to explore "Variability-Aware Software for Efficient Computing with Nanoscale Devices." Dr. Dobb's, which covers "the world of software development," picks up our story about the National Science Foundation's $10 million, five-year grant to Calit2-affiliated researchers who will explore "Variability-Aware Software for Efficient Computing with Nanoscale Devices." PhysOrg.com runs our story about the National Science Foundation's $10 million, five-year grant to Calit2-affiliated researchers who will explore "Variability-Aware Software for Efficient Computing with Nanoscale Devices." A visionary team of computer scientists and electrical engineers from six universities -- including UCSD -- is proposing to deal with the downside of nanoscale computer components by re-thinking and enhancing the role that software can play in a new class of computing machines that are adaptive and highly energy efficient. Coming soon to a classroom near you: Robot teachers? Meris Stansbury, Associate Editor of eSchool News, profiles the RUBI Robot, which was developed by the Machine Perception Laboratory at Calit2. The newspaper quotes Calit2 Director Larry Smarr, who likens the Labor Party's plan to invest up to $42 billion in the continent's cyberinfrastructure to the 1956 decision by president Dwight Eisenhower to build the publicly funded interstate highway system. La Jolla Light reporter Lynne Friedmann reports on the CISA3/Calit2 initiative known as Training, Research and Education in Engineering for Cultural Heritage Diagnostics (TEECH), which will create "digital clinical charts" that "allow the monitoring of artifacts over time and informed decision making about restoration, repair, and other solutions." Reporter Steve Lohr of the New York Times "Bits" blog quotes Calit2 Director Larry Smarr, who calls Tasmania's new policy ?one of the most interesting experiments in the world.? Popular Science reports on the world record broken by computer scientists from the University of California, San Diego, who sorted more than one terabyte of data (1 000 gigabytes or 1 million megabytes) in just 60 seconds. 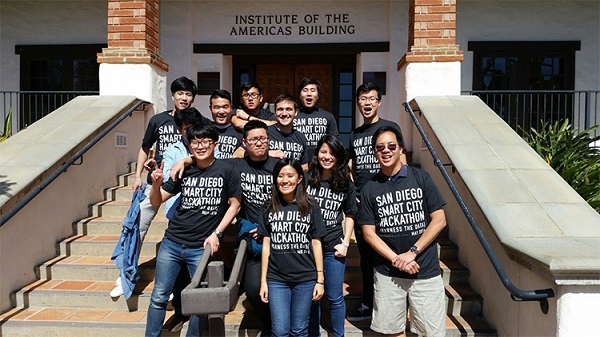 India Vision covers UC San Diego's victory in the "Sort Benchmark" competition - the "World Cup of data sorting" when it broke the world record by sorting more than 1 terabyte of data. when it broke the world record by sorting more than 1 terabyte of data. The Indian version of Yahoo! News reports on the world record broken by computer scientists from the University of California, San Diego, who sorted more than one terabyte of data (1 000 gigabytes or 1 million megabytes) in just 60 seconds. The Gaea Times reports on the world record broken by UCSD computer scientists, who sorted one trillion data records in 172 minutes ? and did so using just a quarter of the computing resources of the other record holder. TMC.Net picks up our story on a 3-year NSF grant awarded to UC San Diego, Northwestern University and the University of Illinois, Chicago, to encourage and enhance digital communication and collaboration between the U.S. and international science and engineering research and education communities. UCSD computer scientists tied two world records during the 2010 ?Sort Benchmark? competition ? the ?World Cup of data sorting. Computer scientists from the University of California, San Diego broke ?the terabyte barrier? ? and a world record ? when they sorted more than one terabyte of data (1,000 gigabytes or 1 million megabytes) in just 60 seconds. HPCWire, which "covers the fastest computers in the world and the people who run them," reports on UCSD's three-year, multi-university grant from the National Science Foundation (NSF) to encourage and enhance digital communication and collaboration between the US and international science and engineering research and education communities. Scientific Computing, purveyor of news on 'information technology for science,' reports on two records broken by UCSD computer scientists for sorting more than one terabyte of data (1,000 gigabytes or 1 million megabytes) in just 60 seconds and sorting one trillion data records in 172 minutes. Calit2 Director Larry Smarr discusses the subject of his address to AT&T Labs Research, wuch covers several affiliated projects with Calit2 that are aimed at increasing ICT energy efficiency. Science Daily reports on the new world record set by computer scientists from the University of California, San Diego when they sorted more than one terabyte of data (1,000 gigabytes or 1 million megabytes) in just 60 seconds. Chattahbox picks up our story on the world record broken by UCSD computer scientists at the "Sort Benchmark" competition. It was an epic day for heavy-duty data sorting when computer scientists from UCSD broke "the terabyte barrier" -- and set a new world record -- when they sorted more than one terabyte of data (1,000 gigabytes or 1 million megabytes) in just 60 seconds on a computing cluster at Calit2. Tasmania's Premier, David Bartlett, releases a comprehensive summary of events on his nine-day trip to the United States, including his collaboration with Calit2 Director Larry Smarr at the Australia America Leadership Dialogue. Campus Technology reporter Dian Schaffhauser reports on HUVR, "a virtual reality device using a 3D high definition TV along with a haptic technology that allows users to view 3D images but also touch them." Dr. Dobb's picks up our story about Head-Up Virtual Reality (HUVR), which is ideal for tasks that require hand-eye coordination and is well-suited to training and education in structural and mechanical engineering, archaeology, and medicine. The Spanish news service reports on UCSD researchers at Calit2 who created a device that "allows users to touch a generated image as if it were a real material with a physical presence." In its 'Engineering Trends' section, this news service reports on the creation of a virtual-reality glove that "allows users to touch digital images as if they were real." Inavate, the leading online resource for Pro AV technology and integration in Europe, the Middle East and Africa, reports on Calit2's new HUVR technology, calling the device's Samsung 3D TV "the key to allowing users to view, manipulate and feel 3D images via a low-cost, portable display." PhysOrg reports on Calit2's HUVR, a new, relatively low-cost virtual reality device that allows users not only to see a 3D image, but 'feel' it, too.